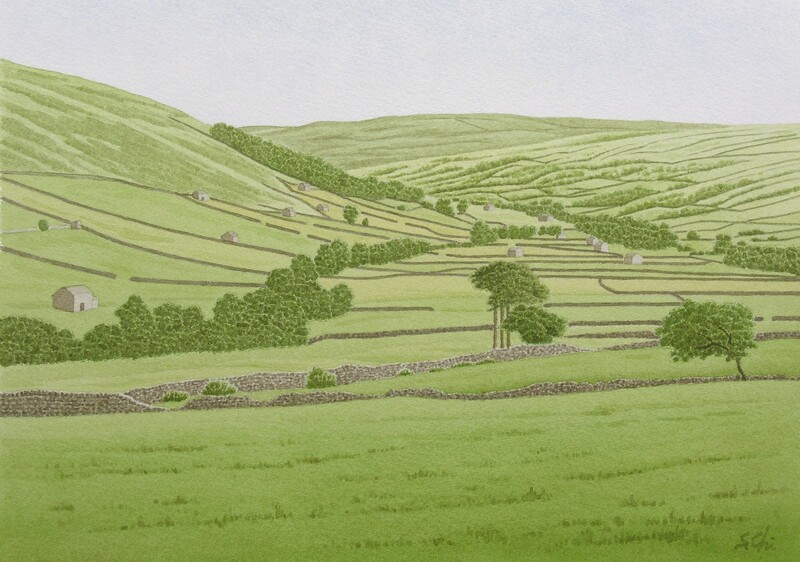 Looking back towards the direction of Muker from above Thwaite, I found a splendid view of Swaledale. It was a refreshing and really beautiful view and very Swaledale. Karel Capek, a Czech journalist and writer, described his travels in England in the journal, "Anglicke Listy": the countryside of England exists for feasting their eyes not for working there, and it is full of greens like gardens and innocence like the heaven. I agree with him thoroughly and would like to replace the word of "England " with "Yorkshire". The motoring atras of England marks the view points where we can enjoy the scenery. I found there is only small parking space for one or two and a bench at such a point. I, once in a while, saw an elderly couple were sitting on the bench and reading books or knitting something. And they were sometimes enjoying the views with chatting. They seemed to spend a whole day by doing so until the sun sets in the west. I caught a glimpse of one of the English people's ways of life in the countryside, I thought.